Cooled down from our record November temperatures, Sydney? 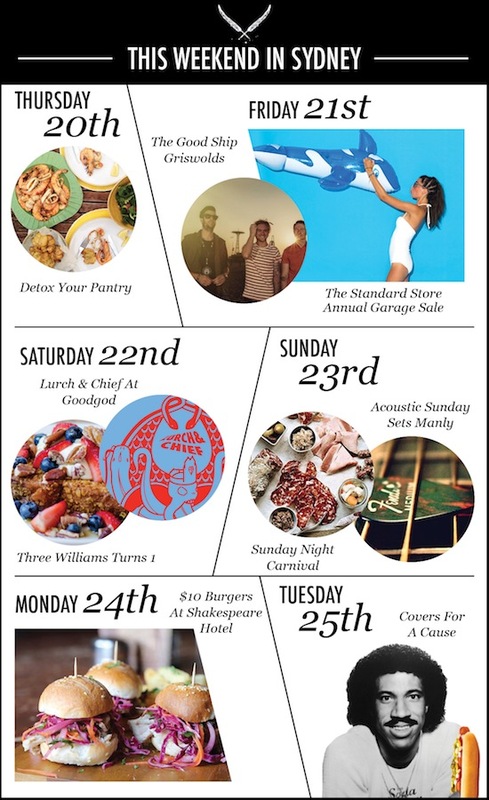 This weekend we can get you jamming with Aussie band The Griswolds aboard a Sydney harbour cruise, get your heart pumping at a screening of Underground Cinema classics, deck you out with some heavily discounted designer threads at The Standard Store Garage Sale, or even add some carnivale to your life, to name but a few. Our city never disappoints! Need help simplifying your diet and generally eating the "right' way? This event can assist to not only put you on the path to cleaner eating, but also give you the tools to get you there, by means of recipe ideas and places to shop (that won't break the bank). Your stop to a leaner, cleaner 2015 is one event away. Tickets are limited, so get in quick – your summer body implores you! If you are not satisfied with the standard movie protocols of 2014, and require a little more intrigue and oomph with your entry ticket, then the Underground Cinema Classics experience has your name all over it. Live performances based on the cult classic you are paying to see are re-enacted before you, to heighten the mood and give you more bang for your buck. These screenings come with a warning and a dress code so come ready to RUN! Having staged these screening all over the world, and also having already sold out in Melbourne, you had better get in for a movie experience you will not soon forget. Home grown talent The Griswolds are presenting their debut album, and they're inviting you along, in your best 1980's Miami inspired gear. The band, in conjunction with the Jack Daniels Future Legends initiative, will set sail along the picturesque backdrop that is Sydney harbour and will be playing the music you know and love and much more from their debut set. After your harbour voyage, you will be transported to an undisclosed location where you can dance the night away with the band and fellow groupies. The Griswolds + Jack Daniels + Sydney Harbour = sign us up! We are all very grateful to owners of The Standard Store, Nicola & Orlando Reindorf for bringing us our cult international designer labels, previously unattainable on our shores. But now we have more reason to be thankful as they are having (in their words, so you know they mean business) the mother, father, brother and sister of all sales this weekend. With savings of up to 90% off, you can be sure to find a sneaky bargain from some of your favourite brands, the likes of Y.M.C, Carven, Maison Kitsune and many, many more. They're having a VIP Presale on Thursday, but the rest of us fashionistas have Friday 10am-6pm and Saturday 10am-3pm to head to Paddington, cash in hand. Lowroad Gallery, rear of 76 Oxford Street (Down the steps by Ampersand Café) Paddington. Melbourne sextet, Lurch & Chief are performing at GoodGod Small Club's Danceteria this Saturday night as part of the national tour to support their new single "Keep It Together". The band was 'unearthed' with the help of Triple J in 2012 and have gone from strength to strength, coming off a sold out tour earlier this year. And judging from the response from their latest single, we suggest getting your hands on some tickets ASAP. We also suggest heading down to GoodGod a little earlier for some Caribbean eats from Jonkanoo. We cannot believe it has been a year since we first sampled the delights from Redfern café Three Williams. Priding themselves on great coffee and restaurant quality food at café prices, Three Williams would like you to come down and celebrate this milestone with them. To further entice you (as if their handmade homemade cookies weren't enough) they're offering free coffees with breakfast orders for their first 100 customers on both Saturday and Sunday, as well as having a very sumptuous ice cream cart from 11am, thanks to RivaReno gelato. Prizes and giveaways throughout the weekend, as well as face paining for the kids, this birthday party promises to be a hit for 'kids' of all ages. When you think of a Sydney summer, we're sure your brain would first take you to the beaches and harbour our city is so famous for. Is there nothing more idyllic than a ferry across the harbour to the iconic Manly wharf in search of your perfect lazy Sunday? Add a cold drink and some smooth acoustic sounds with a sea breeze and you've found yourself at the Manly Bowls Club, in their new downstairs bar, enjoying their Acoustic Sunday Sets. From 2pm till 5pm, starting this Sunday and running most of summer. The Victoria Room on Victoria Street is a Darlinghurst institution. For over a decade we have been transported to another era with the stylish décor and sophisticated charm this cocktail bar and restaurant are renowned for. They have decided to not only transport us back to the Victorian era, but to also entertain us with their weekly Sunday Night Carnival. Come along, grab a cocktail and some delectable delights from the specially designed Sunday menu, and watch a showcase of local and international musicians and artists wow you in weekly spectaculars varied in both substance and style. Performances start at 7:30pm. Book online to reserve your table. Okay. So you've had a big weekend, Monday has rolled around and you drag yourself off to work, praying for Friday to come back, right? We have all been there. So the last thing you want to do after the grueling ordeal that is Monday is get home and realise you have to cook something for dinner, right? Well, the Shakespeare Hotel can take care of you and your stomach's needs with $10 Burgers on Monday nights. Choose from the classic American cheeseburger or the portobello mushroom and haloumi. All $10 each, all served with chips. Get there between 4-6pm for $4 happy hour (that's right, $4 beer, wine and spirits) and if the mood strikes you and you're feeling like a smarty pants, stick around for the Trivia upstairs from 7:30. Bring your friends. Technology and the advances we have made through technology have made us the society we are today. Global Educational institution General Assembly have teamed up with digital network Mashable to bring you the Future of Digital – a festival of learning; a day of talks and panels where 25 digital leaders and influencers discuss and share ideas on technology, design, digital trends and the future of how the digital age will continue to alter our lives. The day is full of open discussions on the future of technology, as well as talks from industry insiders who know best. Tickets are on sale online and the learning festival will run from 9am-6pm. Get in early for registration and to secure your seat. The Soda Factory has chosen to highlight Movember in this month's installment of their "Covers for a Cause" events. The Soda Factory utilises their in-house musicans and artists to pay homage to musical greats, all in the name of charity. This month Movember is the highlighted charity, so the musical tributes will have a history of the moustache. So expect the likes of Jimi Hendrix, Freddie Mercury, George Michael and The Beatles, all to raise money for men's health issues. The Soda Factory is also generously donating a gold coin for every drink or food item sold throughout the night. Drink, eat and donate for a good cause helping early cancer detection and prevention. See you at the Soda Factory from 5pm till last drinks! From humble beginnings to the now state of the art entertainment facilities, function rooms and dining options; this leagues club definitely caters for all. For things to do in Sydney that will work our brain muscle, head to Keato's Brasserie for Trivia Wednesdays. You're encouraged to come along for a meal and or a drink, and test your knowledge amongst other worthy local competitors from 7pm. Besides cash prizes for placing within the top 3, there are spot prizes throughout the night, so come along and test you general knowledge for what you can expect to be a fun-filled and relaxed Wednesday night out. Good luck!